Obtain roasting chicken. Check centre cavity for giblets and remove if present. Icky Squicky dance appropriate and accepted. Rinse bird and pat dry with paper towel. Rub all over with olive oil, dried rosemary, fresh salt and pepper. Spank and/or dance with fleshy carcass if the mood strikes. Play voodoo doll with one lemon and stab liberally with fork, pretending it’s a hated co-worker/ex-boyfriend/authority figure. YMMV. 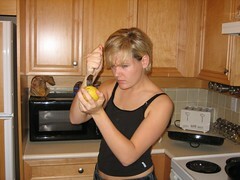 Shove lemon inside carcass. Apologize to bird for violating it. Don’t necessarily mean it. 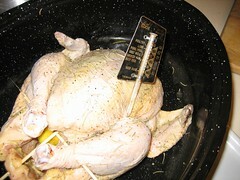 Stab chicken with Meat Thermometer in the thigh. Better it than you. Unless you like that salmonella thing. Put dead, drowned, rubbed, violated, wounded chicken in small coffin (aka roasting pan) and roast in a 400 degree oven for about 35 minutes or until meat thermometer reaches “chicken done” range. Bonus points for being clever enough to remember to take the lid off for the last 5 minutes so the skin gets all crispy. Don’t even pretend you’re not going to eat it like you’re on a diet or something. Everyone knows its the best part, and we also know you’re going to wolf it down as soon as you think nobody’s looking. It’s ok, your pants will forgive you. You can have salad tomorrow. 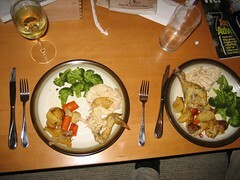 Remove cooked and browned chicken from oven and place on tray to rest for a few minutes. cover with foil to keep warm. While the meat is resting (it’s had a hard day!) throw together some side dishes. There is no shame in making something out of a box and/or can at this point. After all you just Roasted Meat, you June Cleaver you! 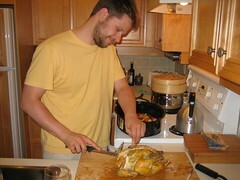 Find houseboy (or if you don’t have one, hot boyfriend) to wield tools and carve bird. Failing those, do it yourself, cuz you’re a superstar like that! 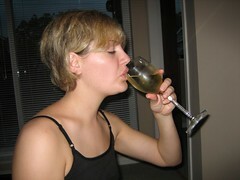 Pour glass of favourite libation – down that, then pour another – light some candles, and enjoy your dinner! 1) DRIED rosemary? Pshaw and fie. 2) I had a quick look through all my cookbooks, and yep, this is the first time I’ve ever seen “spank fleshy carcass” in the instructions. mmm looks good. must have smelled so tasty in your house! i’ve done something similar but rubbed the seasonings under the skin. that does require a bit more violating of the bird and a bit more salmonella under your fingernails though. j: believe it or not, I find dried herbs make better meatrubs. Yum! I do basically the same thing only with breasts instead of a whole bird.